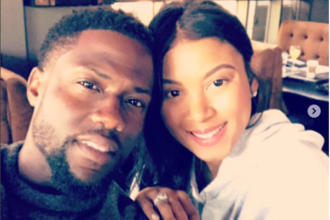 Kevin Hart and ex-wife Torrei Hart are engaged in a war of words over the end of their marriage and whether his current girlfriend, Eniko Parrish, was involved. 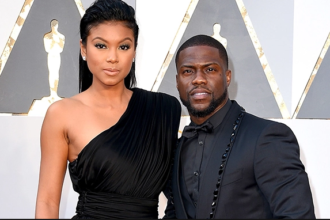 Kevin Hart today slammed his ex-wife Torrei Hart pictured above (left) on twitter after she said in a recent interview that he cheated on her with his current girlfriend, model Eniko Parrish (pictured with him right). Kevin claimed he’d been separated from Torrei for 7 years and Eniko had nothing to do with their divorce. Torrei took to twitter to remind him that they have a 6 year old son, so his dates don’t make no sense. She also insisted that Eniko was one of the reasons her 10 year marriage packed up. Torrei Hart says this is BS, and that Kevin’s denials don’t hold water, insisting Eniko Parrish was sleeping with the Ride Along star while they were married. In fact, Kevin was set off in the first place by an interview in which Torrei Hart slammed Eniko Parrish, saying she wanted to knock her out. Good stuff. Did Kevin Hart really cheat on his pregnant wife?